When you meet someone who follows a passion with dedication and humility, who loves every single part of the process of creation, you should stop to witness art in its purest form. Marina is this kind of person. She’s very close to nature and loves to include all her senses in her work. Whatever she does, she uses her eyes, her nose, her taste, her sense of touch to get the whole picture. Her perception is holistic, she’s a true artist, and I adore her for this reason. Food is her profession, her feel for simple yet stunning combinations of flavours is outstanding. To watch her picking fruits and vegetables in the extensive gardens of Villa Bologna, foraging for wild fennel, chives, and allspice is calming, as you can see a woman who has found her peace. The first time we met, this Swedish lady caught me with her smile. 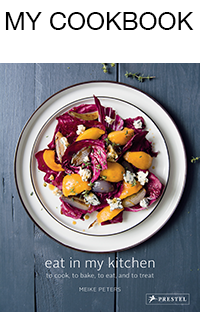 It was at a lavish lunch at a mutual friend’s palazzo, at last year’s meet in your kitchen feature with Alex and Benjamin. 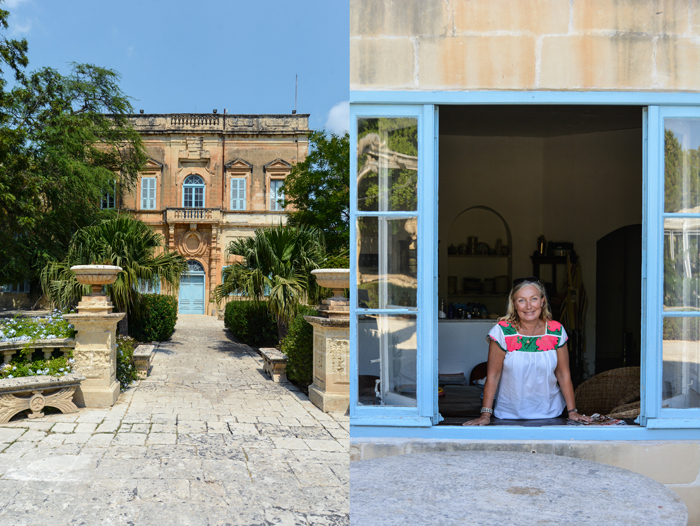 Marina and I clicked straight away and decided to meet so that she could show me the place where she had just started a restaurant – which soon became the restaurant that all of our friends in Malta started talking about: The Villa Kitchen at Villa Bologna. Be it for a romantic dinner or a birthday garden party, everybody who loves food wants to visit Marina’s kitchen in the heart of Attard where the stunning villa is located. Villa Bologna was built in 1745 by Fabrizio Grech, as an extravagant wedding gift to his daughter Maria Teresa, married to Nicholas Perdicomati Bologna, the namesake of the opulent Baroque villa. One of the family’s most politically influential descendants, born in 1861, was Gerald Paul Joseph Cajetan Carmel Antony Martin Strickland, 6th Count della Catena, also known as the 1st Baron Strickland. The busy Lord’s roles included being Prime Minister of Malta, Governor of the Leeward Islands, Governor of Tasmania, Governor of Western Australia, and Governor of New South Wales, in addition to being a member of the House of Commons and House of Lords in the Parliament of the United Kingdom. Over hundreds of years, the members of this aristocratic Anglo-Maltese family left their marks in Malta, both politically and culturally. 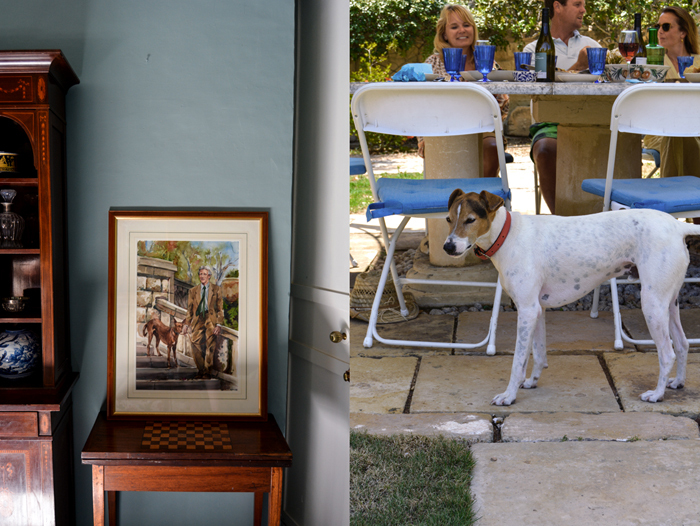 The Stricklands are part of the Mediterranean archipelago, their roots are British, but their influences combine English and Maltese traditions. Lord Strickland and his first wife, Lady Edeline Sackville-West, had eight children. One of their daughters, Hon. Mabel Edeline Strickland, was an exceptional and remarkably modern woman of her times. She was a pioneer of emancipation, co-founder of The Times of Malta and one of the principal political leaders of the 1950s. Her older sister, Hon. Cecilia Victoria Strickland, established a strong support for the arts. Cecilia founded an arts and crafts institute in the 1950s and archived numerous traditional Maltese blue prints for lace and fabric patterns. She understood the importance of protecting the arts and knowledge of former generations. 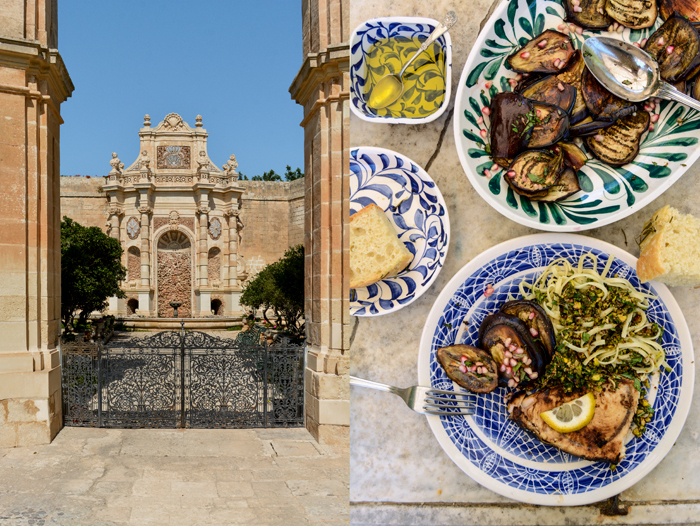 The traditional pottery attached to the premises still uses the old patterns for its beautiful designs, to create plates and platters that turn every table into a Maltese feast. I love the minimal design and its strong colours, which seems so modern even in our days, all hand painted on robust white ceramic. Although times have changed, the villa is still a place to learn about the past and appreciate the crafts of former generations. Cecilia’s son, Gerald de Trafford, and his wife Charlotte opened the villa to the public eye for weddings and events in the 1980s. 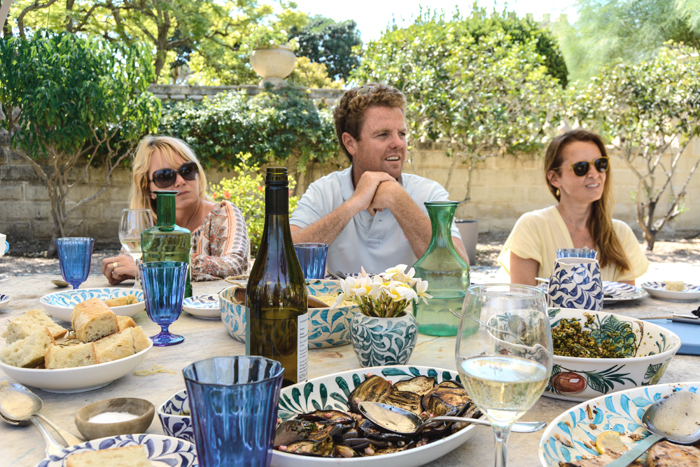 Their son Jasper has taken care of the villa since 2009 and initiated further projects. The current restoration of the representative rooms on the villa’s ground floor should be finished in autumn, when guided tours will be offered by appointment. 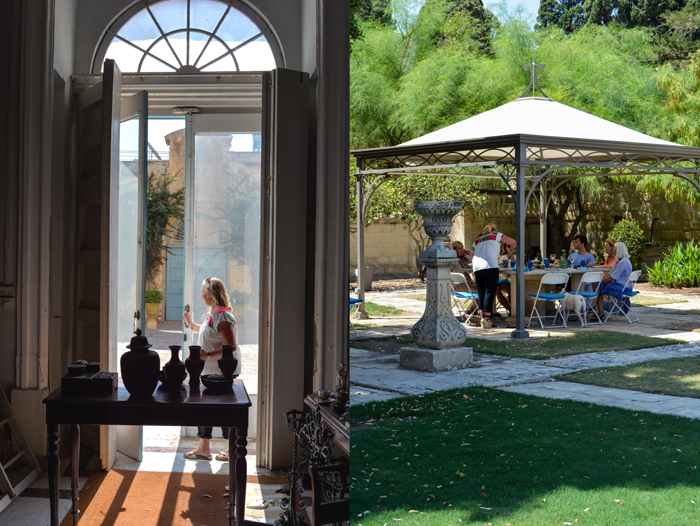 The visitors will get an idea of the original life at Villa Bologna. 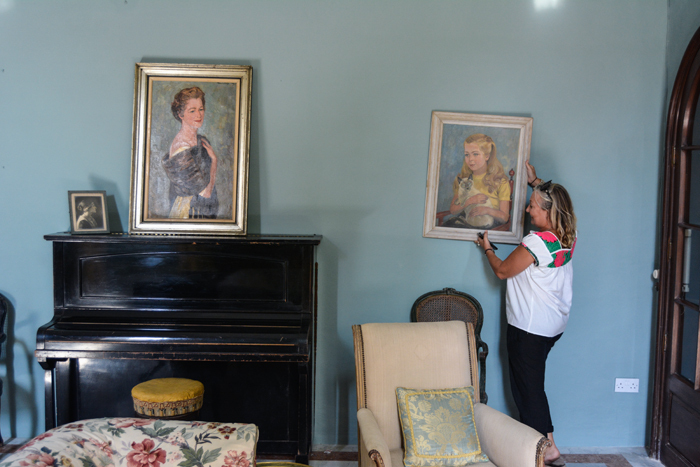 To present the house in all its glory, Marina is strongly involved in the creative process of going through hundreds of years of furniture, artworks, and tableware, as is Jasper’s mother Charlotte who has called the villa her home since she was a young woman. Marina left London, her former home, two years ago to come to Malta and live here with her boyfriend Dom Strutt who’s a close friend of the Strickland family. She brought many years of catering experience with her, which she gathered while working as a chef in England’s capital. 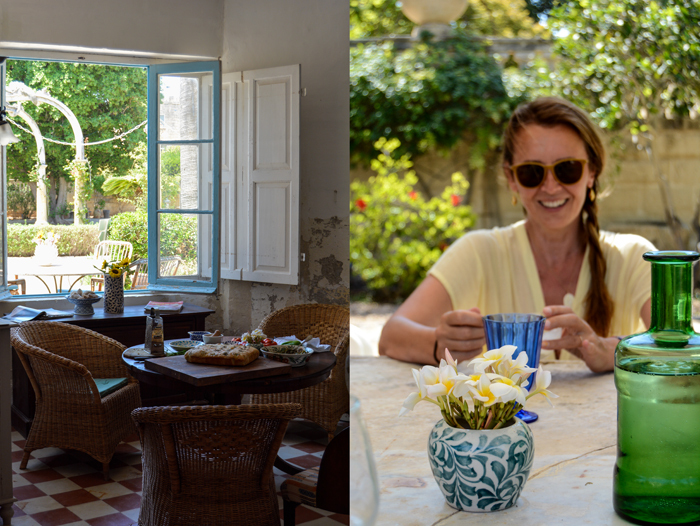 As soon as she arrived on the island, she started building up The Villa Kitchen, aiming for an honest, simple, and creative style of Mediterranean cooking. Marina and I have a similar approach in the kitchen, we try to avoid too many ingredients and distractions, just the right combination, with maybe one element that breaks the usual pattern. Marina’s next step is to transform her vision from food to perfume. Her senses and sensitivity that guide her explorations of the culinary world work just as well in the world of aromas and led to three unisex perfumes united under the name Neroli & Spice. The beautiful perfumes enticed me with strong notes of spices and citrus, they will be launched this autumn, at the same time as my book, which I’ll celebrate at an event at Villa Bologna. Somehow, Marina and I have had a strong bond ever since we first met under the hot Mediterranean sun. 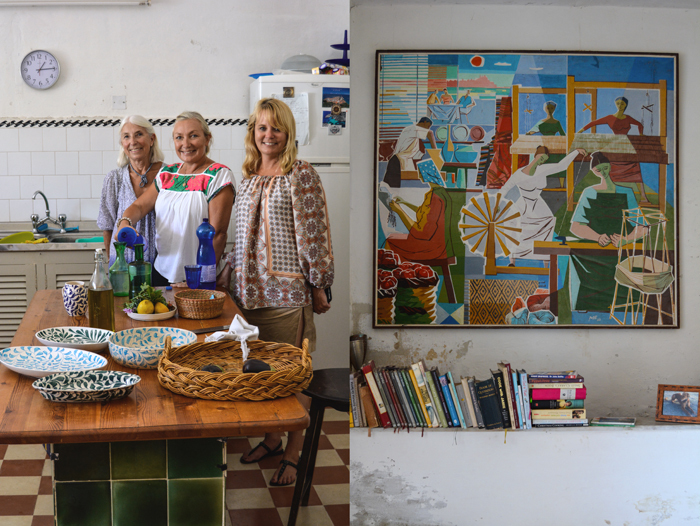 Last week, we met to cook together and Marina turned lunch into a summer feast with family and friends from London, Malta, and Sweden. 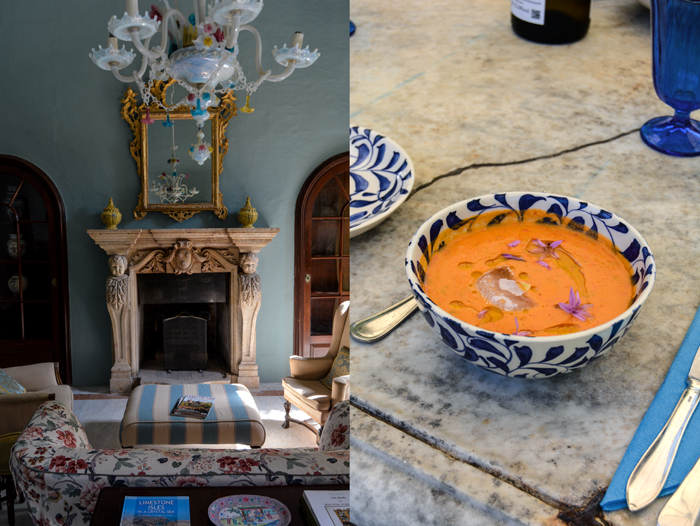 She caressed our taste buds with Gazpacho made with tomatoes and peppers fresh from the garden, refined with anchovies – her little secret – to enhance the vegetables’ flavours. The fish is not dominant, but delicious. 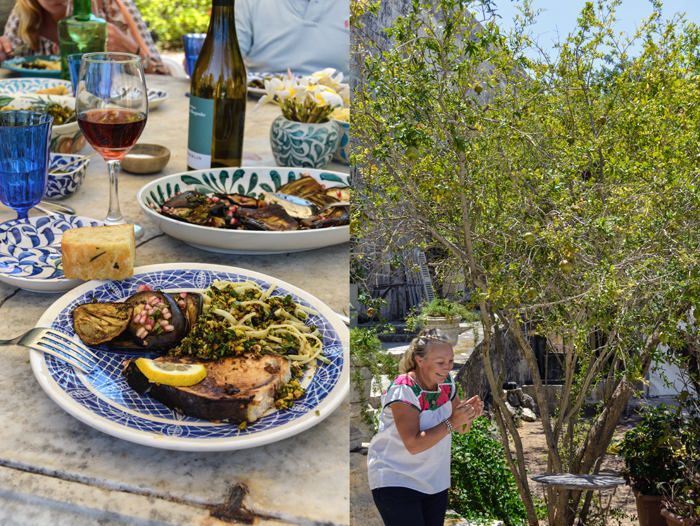 The meal moved on to swordfish marinated in lemon oil and linguine with an amazing pesto made with lots of pistachios, fennel, and parsley, accompanied by oven roasted aubergine with pomegranate and warm rosemary focaccia. The dessert was divine, but I’ll keep it a secret for now and share it next Sunday, it’s one of Marina’s famous signature dishes! Marina is planning a ‘Food & Travel’ trip for late September, it will be a 1 week gourmet holiday / workshop in Spain to celebrate good food and wine, click here for more information. Follow Marina, Neroli & Spice and Villa Bologna on Instagram. Blend everything in a food processor till smooth, season to taste, and chill. Divide the Gazpacho soup between bowls, add an ice cube, and drizzle with a few drops of olive oil and some chopped basil. Spread the swordfish on a large plate. Combine the lemon juice, lemon zest, rosemary, a generous splash of olive oil, salt, and pepper, add to the swordfish, and mix well, using your hands. Let it marinate while you prepare the pistachio sauce. In a dry frying pan, toast the fennel seeds first and then the pistachios till fragrant. Grind the fennel seeds in a pestle and mortar. Grate or finely chop the garlic. Chop the pistachio nuts and parsley quite finely and mix the dry ingredients in a bowl. Add the lemon juice and olive oil bit by bit to create a sludgy texture. Season with salt to taste. Slice the eggplant lengthwise and spread on an oiled baking sheet. Drizzle a little olive oil on top, sprinkle with a pinch of salt, and roast in the oven for 15-20 minutes or till dark golden. Let the slices cool to room temperature and layer on a serving dish. Sprinkle the pomegranate seeds and chopped mint on top and drizzle some syrup over, if using. Cook the linguine till al dente while cooking the swordfish: In batches, panfry the swordfish steaks in olive oil, about 5 minutes on each side over medium-high heat or till slightly golden. They should be just cooked through. Divide the swordfish, pasta, pistachio sauce, and eggplant with pomegranate between plates and enjoy. You grew up in Sweden and lived in London for 20 years, but you’ve lived in Malta for the past few years, what made you settle in the Mediterranean? My friend Jasper de Trafford, the owner of Villa Bologna was looking for someone to set up a cafe / restaurant at the villa and I had been looking for the right opportunity to change my London lifestyle. It was the perfect chance for us both to start a new venture. Was it hard to switch from a northern European to a southern European culture? 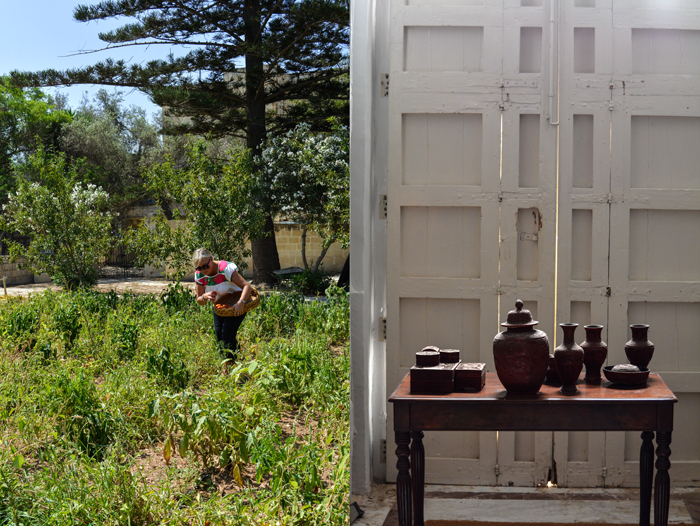 What do you like about the Maltese way of life? No, it wasn’t difficult at all. I’ve always had it in my blood since my father is Slovenian and I spent much of my childhood in Portoroz on the Adriatic. I love the Maltese way of taking each day as it comes and the enthusiasm for new projects and the friendliness of the people. It’s made me feel very welcome here and has made it easy to settle in. Do you remember what you felt when you first visited Villa Bologna? I first visited six years ago for Jasper and Fleur’s wedding party at the villa and I was totally smitten by its’ enchanting beauty and charm. Having run The Villa Kitchen restaurant at Villa Bologna for 2 years, what do you enjoy most about being a chef and about cooking in general? The best thing for me is the creative process of putting together local and seasonal produce in an endless variety. 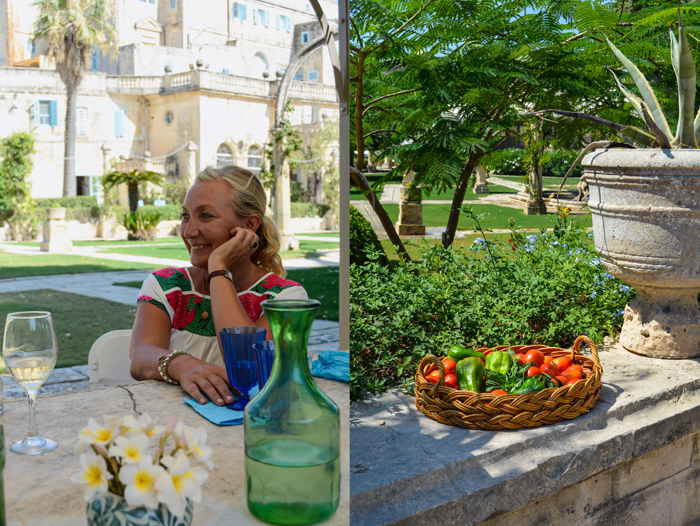 The villa has its’ own organic fruit and vegetable gardens so there is always fresh and delicious ingredients to use. It’s a cook’s dream to be able to pick and choose straight from the field to the table, so to speak. It’s also amazingly satisfying to have happy customers enjoying our food! 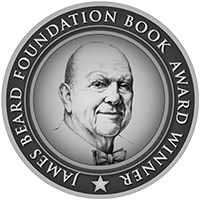 What inspired you to start a career in food? Food has always been a passion for me and I suppose that I’m a natural cook. 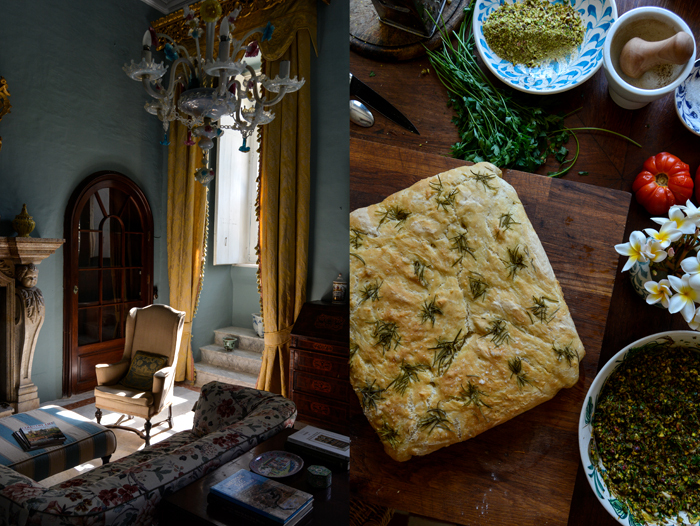 I had an opportunity to set up a catering business in London with Andrea Bauer-Khadim, formerly of Grosvenor House and Somerset House, called Wild Peacock Events. We catered for high end occasions from weddings to intimate dinners and cocktail parties. This gave me experience in working with food on a professional level and gave me confidence to start The Villa Kitchen here in Malta. My mother Britt-Marie also encouraged me and helped me set up the cafe from scratch. She has been an enormous help and a very hands-on collaborator particularly in developing fantastic products for our shop, such as marmalade, chutneys and cordials. You’ll be launching your first perfumes this autumn. Are there similarities in working with food, which needs the attention of all of your senses, and with fragrances, which are purely developed with the help of your nose? Yes, this may seem like a departure from food and cooking but for me it’s very much a continuous progress. When cooking, I focus on the layering of flavours and balancing spices, herbs and other ingredients in order to achieve a whole result. There are many similarities in creating perfumes using Mediterranean scents such as citrus, spices, herbs and botanicals. The process of layering and balancing to create a specific vision is similar whether olfactory or gourmet. This crossover inspired me to create Neroli & Spice, which is launching as a niche perfume house soon. My best friend Gunilla Freeman is my partner in this venture and she brings business savvy and a brilliant eye for detail. Do you have the final composition in mind when you start working on a dish or a perfume or do you add ingredients until the result fits your vision? 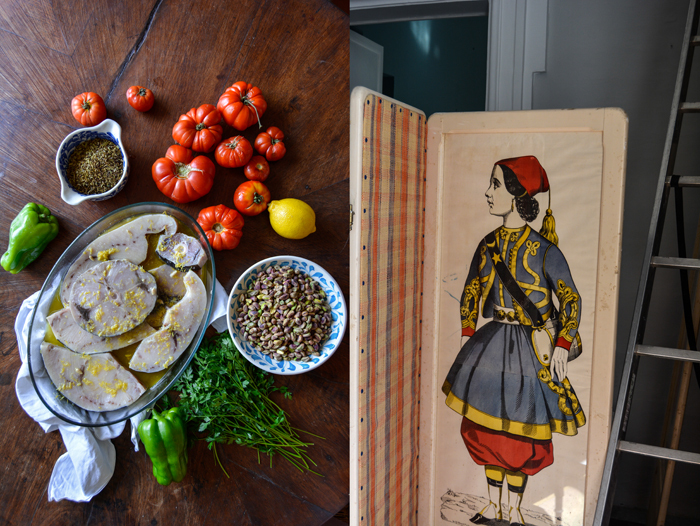 I’m strongly influenced by my travels – in particular to Egypt and North Africa – and places which hold a special place in my heart, both when creating dishes and perfumes. So I start off with a sensory memory or picture, which I then aim to evoke through experimenting and mixing until I feel that the result is right. Where do you find inspiration for your creative projects? How do you develop new recipes – for food and perfumes? Inspiration comes from my impressions and experiences through travel, culture and my background as a Scandinavian with roots in the Mediterranean, having lived in Sweden, Slovenia, London, Los Angeles and now Malta. What are your future projects for Villa Bologna? My main focus will be on curating and putting together the main rooms in the villa for it to be opened to the public. I am collaborating with the de Trafford family to create a unique insight into the way of life at this grand historic house which has been in the same family since it was built in 1745. 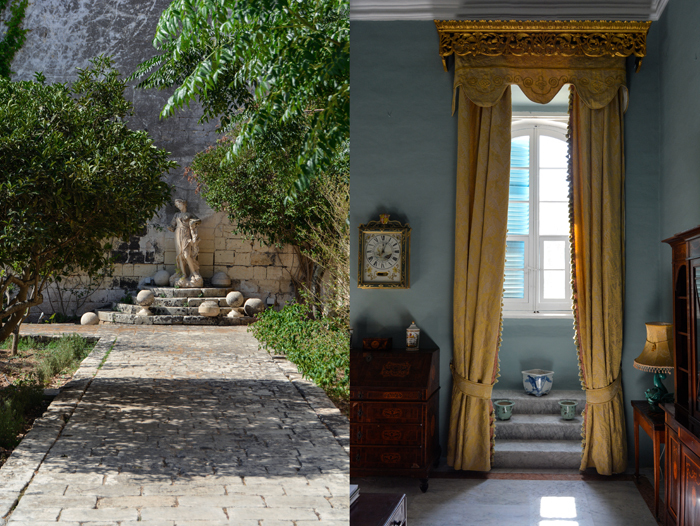 There will be guided tours and we are looking forward to welcoming visitors to one of the finest baroque houses in Malta with its beautiful gardens and ancient citrus groves. 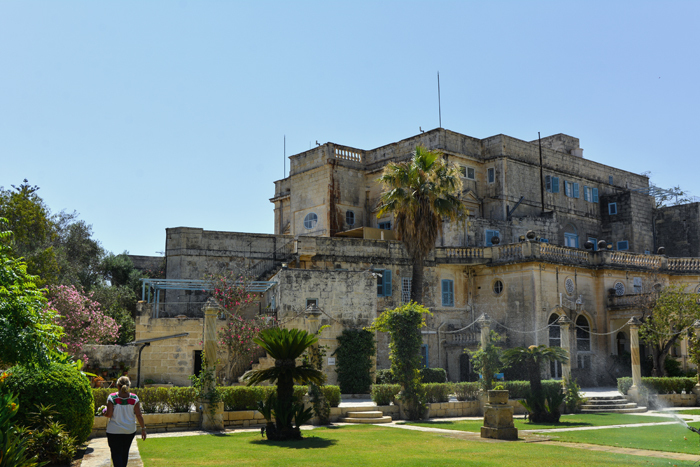 It was the home of Jasper de Trafford’s great grandfather Lord Strickland who was Malta’s prime minister in the 1920’s as well as his daughter Mabel Strickland who founded The Times of Malta. 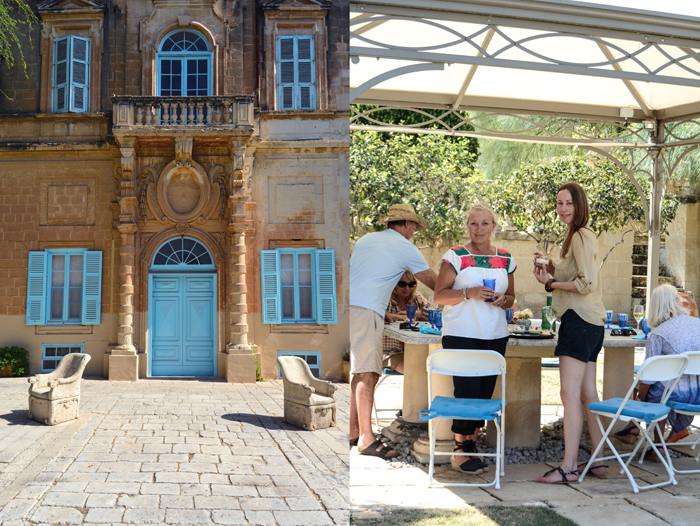 The Villa has been used as a film location on numerous occasions and I’m sure visitors will be interested in seeing where famous actors have starred! We will also host some very special events, such as a Christmas market and classical concerts. I’m also creating a perfume especially for Villa Bologna, called Sans Mal, which is the family motto! I think it was a chicken curry with peanuts and banana for a party as a teenager but I remember helping my grandmother make jams and cakes as a child. Both my grandmothers were amazing cooks. Malta’s has a fantastic climate which produces an abundance of fruit and vegetables all year round. For me, the best places to buy are from the farmers market in Ta Qali and from local grocers specially in my home village of Siggiewi and the farming area of Mgarr. Some of my favourite restaurants are Michaels in Valletta, Il Corsaro by the Blue Grotto, Ta Majjistra in Mgarr and Carmen’s Bar in Ghar Lapsi, where we swim every day. The Corinthia Palace hotel is also a great place to eat. I prefer simple down to earth restaurants who use the best local produce, where one can relax and enjoy the atmosphere. I’d ask my mother to cook creamy chanterelles on toast with mint chocolate mousse for dessert. We would sit in the garden of our summer cottage by the sea in Sweden. Well, I would throw together a tagine or curry or some other one-pot dish with a fresh salad from the Villa Bologna gardens. There are usually a few different ice creams and sorbets in the freezer on standby to finish off with. During the orange season I can just go and pick some delicious fruit as well. I loved my paternal grandmother’s apfel strudel and my maternal grandmother’s roast veal with her delicious creamy sauce, with prune soufflé to follow. I still love these dishes but I suppose I have expanded my taste somewhat. I really love good Dim Sum and a visit to The Royal China in London is always a must. I prefer to cook on my own with an assistant for other people to enjoy! I’m definitely an improvised cook and love spontaneous meals. Anything too fiddly and I would prefer never to cook for a wedding again, it’s far too stressful. Thank you, Meike, for this fabulous virtual trip to Villa Bologna! I have added Malta to our travel wish list! And, I so admire Marina’s passion and adventurous spirit. If you ever come to Malta, you should visit Villa Bologna. This place is heaven, it’s such a peaceful oasis! And Marina is the most wonderful person, we only met last summer for the first time, but it feels like we’ve known each other for years – she’s a great inspiration!